The new Hitachi SK-UHD4000 Ultra HD camera uses 2/3-inch sensors, and takes traditional B4-mount broadcast lenses which Paddy Roache (pictured), director and general manager, Hitachi UK, sees as “the most logical way forward, to allow production companies to make reasonable financial evaluations about moving into 4K. From a technical standpoint, it drops in [to existing infrastructure] beautifully. It’s a TV system camera, not a cinema camera.” It is expected to ship before March, although pre-production models are currently undergoing tests with various broadcasters. 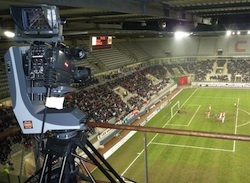 In one, the camera was used in a Sony-based OB truck, “and it slotted straight in. All of the tallies, intercom systems, returns, all plugged in and operated the same way, and because it is 2/3-inch, all the cameramen were able to operate it exactly like an HD camera,” said Richard Harvey, technical director. “It is particularly suitable for sport. It’s a totally workable solution for them,” added Roache.